Vintage cars. I grew up surrounded by the Chevys, Fords, Dodges and Chryslers of the late 1950s and early 1960s. Car buffs take note: Unfortunately, I don’t know much about the mechanics or manufacture of these cars. I am most enamored of their design: the grillwork, the tail fins, the colors. Campers. Our family vacations typically were spent camping in the Pocono Mountains of Pennsylvania, or in the mountain ranges of Maine, upstate New York and Maryland. We slept on air mattresses or cots in a family-size tent, and my parents wouldn’t have it any other way. They disparaged the people who drove into the campground pulling an Airstream, Scotty, or Shasta camper. “That’s cheating,” my father would say. I secretly admired these folks, however. I sensed they were living larger than we were. They had real beds, bathrooms, kitchen sinks, stoves, cute curtains in the windows … all the comforts of home. Airstream dream. I often helped my high school friend with her Sunday morning newspaper route in northern Broward County during the mid-1970s. She drove as I flung newspapers out of the car window to subscribers who lived in everything from palatial single-family homes to high-rise condos to modest apartments and bungalows to matchbox-sized mobile homes in trailer parks along Federal Highway. One of those trailer parks consisted of a narrow drive that snaked around dozens of Airstream campers packed so closely together that I felt as though we had landed in a mysterious twilight zone of oversized sardine cans. Tin-can tourists. The Tin-Can Tourists, a club first organized in 1919 by some of the earliest aficionados of automobile travel and car-camping, held a gathering in Gainesville in January 2013. I brought my camera. 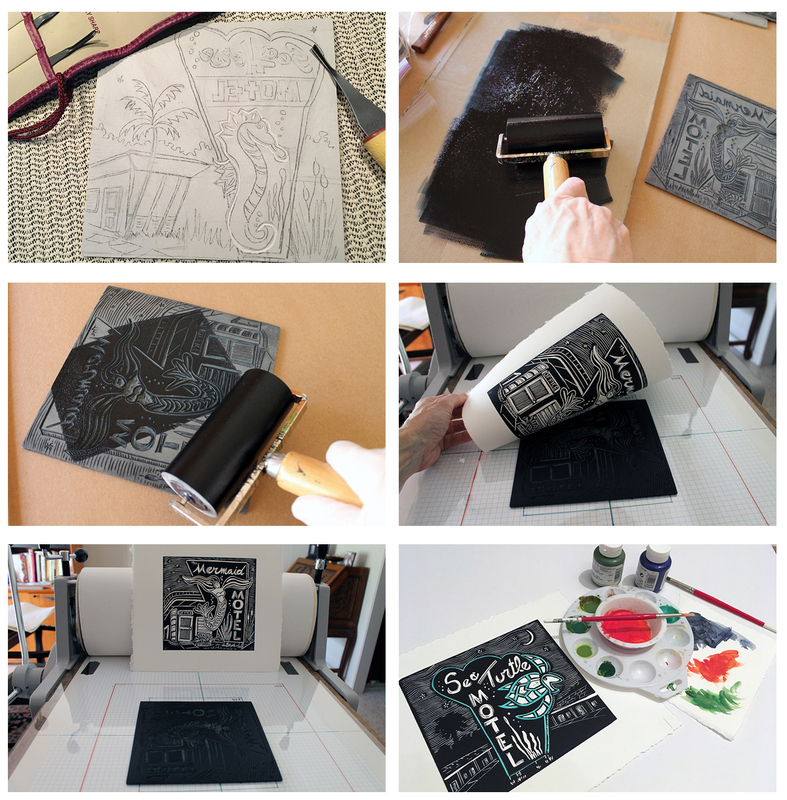 Woodcut-illustrated books. Many of the books I read as a child were illustrated with woodcuts or linocuts. Japanese woodcut artist Jun’ichiro Sekino. It was love at first sight when I discovered Sekino’s series of woodcuts depicting the ancient Japanese Tokaido Road trade route at the Samuel P. Harn Museum’s “Life is a Highway” exhibit. Sekino’s mid-20th century takes on the highway’s 53 stations celebrate the beauty of the built environment with intriguing compositions, bright colors and clean, mid-century modern designs. WPA travel posters. At about the same time automobile travel was gaining momentum in America, the Great Depression took all of the air out of the economy’s tires and syphoned all of the cash out of many Americans’ wallets. President Franklin D. Roosevelt’s New Deal Work Projects Administration (WPA) helped put visual artists back to work with the Federal Art Project (FAP). The project commissioned and funded the creation of a series of posters designed to publicize cultural events and health, education and safety programs in 17 states and the District of Columbia, along with travel and tourism across America. From 1936 to 1943, visual artists created some 2,000 posters using fine art printmaking techniques such as silkscreen, lithograph, and woodcut/linocut. These stunning posters take my breath away. I am especially enamored of the posters that promote Yellowstone National Park, where I spent a summer as a college student working in the park concessions at Old Faithful. Linen postcards. I swoon over the linen-like texture of the paper and the soft, pastel look of the postcards manufactured from the 1930s-1950s. Car tunes. Some of my favorite cruising tunes from the mid- to late-20th century include Chuck Berry’s “No Particular Place to Go,” Aretha Franklin’s “Pink Cadillac,” and Charlie Ryan’s “Hot Rod Lincoln.” I have long wanted to create a playlist of songs from the 1950s and 1960s (and beyond) about cars and driving and cruising down the highway of life. Thank you, Gary Kirkland, for doing it for me. He pulled together and burned a CD containing 27 “Car Tunes” (his title, not mine) that I can listen to while I’m carving, printing, painting, or just plain chillin’. Love it! Heritage highways. The stretch of U.S. Highway 441 in Alachua and Marion counties meanders through some of the most picturesque countryside in North Central Florida. Travelers sojourn through quaint little towns like High Springs, Micanopy and McIntosh, past the ivy-clad red brick buildings of the University of Florida campus in Gainesville, and over the rolling hills and meticulously manicured farms of Marion County’s Horse Country. Here you’ll also find many relics of a time when American car culture reigned supreme: numerous mid-20thCentury-era motor hotels and other buildings sporting the geometric (aka geocentric) features of Googie architecture. Ocala also is home to one of the few remaining operational drive-in movie theaters in the region. This is the Florida I remember visiting as a child. U.S. Highways 441 and 301 are the same roads my family traveled in the early 1960s when we drove from our home in New Jersey to visit my mother’s family in Bushnell, Florida. The motels depicted in my linoleum block prints are similar to the ones we stayed at along the way. I still prefer the slower pace and the spectacular views afforded by this stretch of highway over the breakneck speed and blur of billboards on I-75. Perhaps you’ve even seen me stopped along the roadside snapping reference photos for my prints.